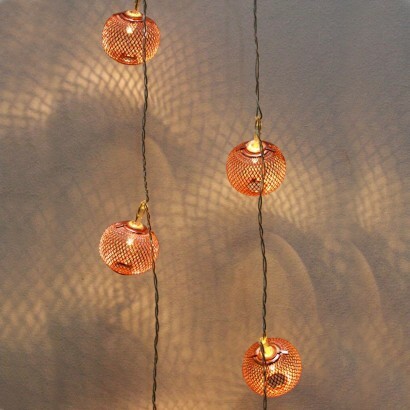 Copper themed lighting on a smaller scale, these adorable string lights are lit by warm white LED's that shine through the copper mesh of the lantern shades to make gorgeous feature lighting. Perfect for adding warmth to your favourite features around your home, loop around mirrors, bed frames and along shelving or arrange inside a clear glass vase for stylish mood lighting with a warm, modern twist. These copper lights were exactly what I wanted. Really attractive with a bright lighting effect. Delivery was very prompt. Excellent value?he & service. These lights are delightful and give a soft warmth to the corner of the room (I have draped them along a bookcase). The shadows created are really interesting too.